Ratings are averaged based on 33 reviews. Very nice place to stay room was good, breakfast was exceptional, only downside was lack of chairs on the rooftop pool, but staff were trying their best to accommodate. Our stay was great the rooms are lovely and big, only thing i would say is that the pool side service could be improved by a better system to order drinks etc, this could greatly increase revenue for the hotel. I stay at U Paasha once a year on my vacation. The staff are so helpful and happy, rooms are clean and have nice linen. Breakfast with the lot - so much variety and my favorite part, is the roof top pool. Central location. See you next year U Paasha! I have stayed in quite a few places in Seminyak and U Paasha is one of the best for value, service and convenience. The hotel is right in the middle of eat street, the rooms are huge, the staff couldn't have done any more for us. The service at the pool was especially good, They always remembered everyone's name, came around with lovely cold water, and complimentary fruit kebabs. They run a room let for 24hours which works perfectly for the late flights that we always get, no moving out of the room at midday. Breakfast was very good, we didn't have any other meals there so I cannot comment on that side of it. I'm so pleased that we booked here. Lovely clean. Rooms amazing huge. Location great. Set up more for couples but even so will return there. Want to go back, excellent hotel and the rooftop pool!!!! This was the second time staying at Upaasha and I would go back again!! It's perfect location, center of everything, and the rooftop pool is perfect for relaxing! The Staff are incredible, they will help you with everything! Highly recommended!! Ps the buffet breakfast is incredible. Love Upaasha excellent hotel would stay here again. Mostly couples, very few kids which made it very relaxing. Great frendily caring service and great location. We must highly commend the services of Suri at breakfast and Gide ands Putu at the roof top pool and bar they were all polite and provide us with amazing service. Staff were all very pleasant and helpful. Great breakfast. Not luxury but good value for what we paid. Fab hotel especially, I think for couples, centrally located in amongst great restaurants and bars in the heart of Seminyak. The staff were very attentive and happy to please. Great breakfast, something for everyone. Only thing and it's a little thing, they may need to pick up their maintenance program a bit. Saying that we will probably return to U Paasha anytime. Value for money, heart of Seminyak shopping and restaurants, very friendly, helpful and professional staff. 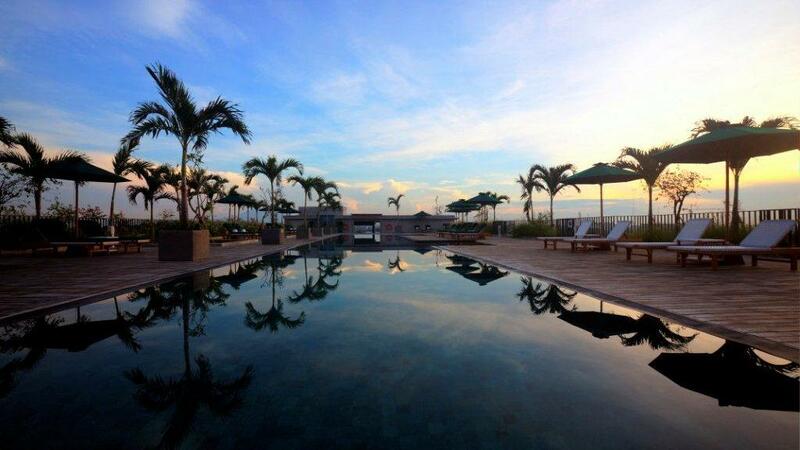 Great pool area for cool breezes, bar and amazing Bali sunsets. Excellent! Staff VERY friendly and assisted with ALL our needs. Excellent accommodation, friendly staff and great location. Will definitely stay at UPaasha again. I love U Paasha - second year in a row. Can't fault it. The service is always amazing and the rooms clean and new. Pool is on the roof so never blocked by shade, however they have umberella's for those wanting it. Great location. Great location. Quiet once your in the hotel, Rooftop is fantastic, very relaxing, great views. Love that U Paasha doesn't allow guests to 'reserve' lounge chairs at the pool. Staff are extremely helpful. great hotel in a superb spot of seminyak would recommend this hotel for couples or individuals. Rooms are really spacious and have everything you need. Water pressure isn't the best in the shower not that it was much of a problem. Breakfast was fine, staff are great & roof top pool was lovely. Our room at UPaasha was amazing. We loved the large polished concrete tiles and stone work. Our kingsize bed was really comfortable and our room was quiet and beautifully furnished. The staff were very friendly and helpful and the breakfast was delicious. We would be very happy to stay again at U Paasha. Great location and great resort! We really enjoyed our stayed at U Paasha. It's right opposite one of our favourite restaurants, Cafe Bali, and is in walking distance to all the great shops and restaurants. It's not too far from beach if you want to take a stroll but otherwise the roof top pool is exactly as pictured. It's quiet and beautiful. The breakfast was better than any breakfast buffet I've had! Best poached eggs I've ever seen too. The room was nice, not perfect but just nice. If I was to be critical I'd say the shower pressure and hot water needs a look at and the air conditioning is quite noisy but neither of these would stop us from staying there again. We loved it. Great staff and superb location. Location was fantastic right in the middle of eat street. The street offers all wonderful bars, restaurants and boutique shopping. Markets are an easy walk away and Seminyak Square within metres. You never need to leave this strip, its all you would want. The room was large, bed very comfy. Floors polished concrete, modern decor clean and fresh. The balcony is very narrow, so not somewhere to lounge on and outlook not that pleasant (villas and vacant land being prepared for a build). The only major annoyance was the airconditioner, whilst effective, it was extremely loud. Couldn't sleep with it on. The shower water pressure is not super strong. But lovely large bathroom, no bathtub. The corridors are polished Concrete floors and very wide, which can lend itself to being noisy, although we only heard the odd inconsiderate guests with children running and screaming up the corridor. The rooftop bar and pool were nice. The bar overlooks towards the beach. Breakfast was typical of a restaurant buffet style offering all the choices you would want. Typical Bali hotel - some good points and some not so good. Large rooms. Lovely rooftop pool. Heart of shopping and eating. Long walk to beach. No bath. Limited powerpoints. Friendly staff. Check in can be slow as rooms not available because of 24 hour check out but 24 Hours check out great for us as we were leaving late. Was a lovely hotel, well position in Eat Street. A great concept of the 24hr checkout system. Friendly and helpful staff. Great location for shopping and restaurants. Had a wonderful time in this groovy hotel. Loved the roof top pool and the view from our fifth floor room. We had a nice stay & it was in a perfect central location. Very happy wit our stay for 7 nights here. Value for money! Right in the heart of Seminyak, and two steps away from a huge array of restaurants ( some 24hrs), shopping, night life and walking distance from the beach. The service was amazing and I think we here in Australia could learn something from the Balinese. Overall the hotel was well presented and the staff were wonderful. The breakfast buffet was very good. The room was always neat and tidy, however with the open plan bathroom it was more suited for couples. The U Paasha was wonderful from the moment you walked in. The architecture is modern and impressive. The staff in all areas were consistently attentive and very friendly. The rooms were spacious and clean and maintained twice a day. The pool area is lovely and the staff there were always replacing towels, offering water and fruit kebabs and cold towels, ensuring you were always comfortable. The location of the hotel is also great, nearby to all the wonderful restaurants and shopping in Seminyak. I would definitely stay here again and highly recommend. This place was lovely. The staff were fantastic and very helpful especially Sophie at Breakfast. The best part was the rooftop pool with amazing views of the sunset. They do need more lounges for the pool area and there is certainly room for them. The only issue i had in our room was that the aircon had a bit of a smell coming out of it and it was very loud but i assumed cause the hotel is fairly new there may be some teething problems. Overall I will be staying there again, such a great place in an awesome location and the rooms were soo lovely and spacious.